This very brief article is written to provide guidance and scriptural support for one of the absolutes of Christianity, The Trinity. Let it be said that any ‘religion’ or ‘denomination’ that does not include The Trinity as part of its doctrine is a false religion or a cult – and certainly has no place in Christianity. These include Mormonism (Church of Jesus Christ of Latter Day Saints), Jehovah’s Witness, Christian Science, United Pentecostal Church (UPC - or any ‘Oneness’ cult), United Apostolic Church, Assemblies of the Lord Jesus Christ, Bible Way Churches of Our Lord Jesus Christ, The New Age Movement, The Way International, Scientology, Living Church of God, Unification Church, United Church of God, Unitarian Church, Judaism and Islam, They may say that they are Christian but they try to twist Christianity into something that ‘makes sense’ and fits their own agenda -- but is certainly not supported in scripture, the infallible, breathed word of God – and therefore are not Christian. Let’s look at what scripture does say about one of the most essential of Christian core beliefs. Here God clearly refers to the Trinity as individuals, in the plural – “us” and “we”. Why would God use the Word ‘offspring’ if not to signify the individuality of Jesus, the Son of God, the Father? Jesus certainly wouldn’t have to ask Himself to give a helper to the disciples. Also, “the helper” referred to here is The Holy Spirit. Here, Jesus also refers to the Holy Spirit as “He” and “Him”, indicating another person. Here Jesus speaks of His Father as a separate entity from Himself and also refers to Himself and The Father as “we”. In Matthew 26:36-46, Jesus is in the Garden of Gethsemane and is praying to the Father and asking, if it is possible, to let the cup of suffering and death that lay ahead of Him be taken away. Just what was going on in the Garden of Gethsemane when Jesus was praying to the Father? Was He talking to himself? 2 Corinthians 13:14 really nails the concept and comfort of the Trinity: "The grace of the Lord Jesus Christ, and the love of God, and the fellowship of the Holy Spirit, be with you all." To get a better grip on the concept of Trinity, let’s look at water. H2O is the symbolic representation of the chemical make-up of water. It consists of two parts Hydrogen and one part Oxygen. 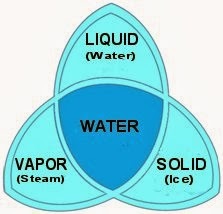 Within this set make-up or structure, water can and does exist in three forms, water, the Liquid, steam, the vapor and ice, the solid. Although water can and does exist in all of these forms simultaneously, it is still water! If you sample each form and analyze its chemical make-up, it will always be H2O. If you look at the picture above you see that this example really makes sense when applied to the Trinity. God can and does exist in the forms of God, the Father, God, The Son and God, the Holy Spirit simultaneously, but these three are still the same God! The three individual elements are intertwined with each other as one entity: three in one. The confusion about the Trinity (is there is any) is due, in part, to our sinful nature. We are not able to see or understand clearly because sin affects all of us and clouds our Spiritual vision and comprehension. On top of this, we live in a defined three dimensional world and if things don't fit that worldly explanation, then we get uncomfortable. We have to try and make whatever it is fit into the universe and reality as we know it. Unfortunately (fortunately), God doesn't live under any of our constraints. He's God and can do whatever He wants. If that means bending everything we understand about our three dimensional world in order to be omnipresent, to be in all places, with every single human, at the same time, 24 hours a day, then so be it. If it means being able to split Himself up into three distinct persons, the Father, Son and Holy Spirit, then so be that as well. It is impossible for us to 'understand' or fully grasp how this is done and there will never be an explanation about how God can do this on the "How Things Work" page. This is simply something we must "understand" by faith - like tumors disappearing overnight or cataracts dissipating in front of our eyes. These are not things that can be 'explained' in our natural world, but exist constantly in God's supernatural world. It is simply because He is God! His thoughts are not our thoughts and his ways are not our ways (Isaiah 55:8-9) and it is to be expected that there are things about God our creator that we, being the simple, sinful creatures we are, simply cannot grasp. One more thing, the doctrine of the Trinity is taught, like so many other Godly concepts, in the unfolding of God's revelation about Himself, rather than in a specific chapter and verse. This is what Jesus meant in Matthew 16:16-18. Jesus tells Peter that the rock upon which the church will be built is the revelation that God the Father gives to us regarding all things. He did not mean that the church would be built on Peter himself but upon the revelation that Peter received from The Father! If we approach the Bible in this way, with an eye open to all things, guided by the Holy Spirit, we will see teachings about the Trinity from Genesis 1:26-28 to Matthew 28:19-20 to 2 Corinthians 13:14, its all there. May the blood of Jesus (The Son in the Trinity) cover, bless & protect you! A Thanksgiving Like No Other!